The Flying Spaghetti Monster meme originated in a satirical open letter, written by Bobby Henderson to the Kansas School Board in 2005, protesting against a proposal to teach Intelligent Design as an alternative scientific theory to evolution by natural selection. Based as it is on the justifications that Scientific Creationists present as evidence that their beliefs are scientifically endorsed, it is an intuitively brilliant personification of a human instinct – confirmation bias. Confirmation bias is the instinct that, to paraphrase Voltaire, gives us humans the wonderful power of being able to find reasons for believing exactly what we want to believe. The instinct that enables creationists to find their own arguments for the literal truth of both Genesis 1 and 2 entirely convincing. It is a mistake to think that this instinct is limited only to the religious. Confirmation bias enables us to form strong social bonds including pair bonds. It enables us to see the members of our community through rose tinted spectacles, and hence to value, the people in the group and our membership of it. It enables us to commit to the shared values and beliefs of our community. It is involved in creation of the kinds of committed social bonds that are conducive to an average increase in the reproductive fitness of those who successfully form them. However these gifts come at a price, the price of factionalism. The price of judging those within our group as better than they really are, is that the other can appear odious by comparison. And we in Ireland have reason, now as when Swift was writing, to know only too well that factionalism can have very nasty consequences. The tendency to judge the actions of our own faction as good, decent, etc.,and those of the other, as morally dubious, can lead to the conclusion that the evil lies exclusively, or almost so, on the other side. It is conducive to violent interaction, because it is obvious to both sides that it is the immorality of the other that is driving the situation. 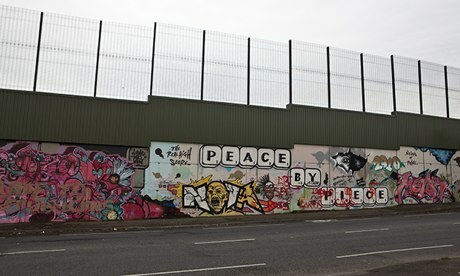 Belfast’s Peace Walls – Protecting Those Evil Awful People Over There, from Ordinary Decent People since 1969. The creationism versus evolution dichotomy that inspired Bobby Henderson’s letter has not, yet at any rate, led to violent conflict between the factions. Bobby Henderson’s satire on the confirmation bias driven rationality of scientific creationists is to my mind spot on. But in the same letter he provides evidence that he too may be a victim of the noodly appendage. What these people don’t understand is that He built the world to make us think the earth is older than it really is. For example, a scientist may perform a carbon-dating process on an artifact. He finds that approximately 75% of the Carbon-14 has decayed by electron emission to Nitrogen-14, and infers that this artifact is approximately 10,000 years old, as the half-life of Carbon-14 appears to be 5,730 years. But what our scientist does not realize is that every time he makes a measurement, the Flying Spaghetti Monster is there changing the results with His Noodly Appendage. The most that the carbon dating has proved is that the material, from which the artefact was made, probably came from an organism that died approximately 10.000 years ago. This totally unnecessary bigging up of the power of science, is consistent with its author being himself blinded by confirmation bias. He has unintentionally in his very funny letter, provided evidence that his opponents may see as further evidence of the irrational nature of the theory of evolution. They would only be entitled to see it as the irrational nature of this one claim, but they too fluff up their evidence. Coming from the source that it does, it should perhaps be no surprise that the American prophet of anti-religion Sam Harris ignored this advice, when in a recent exchange of e-mails he attempted to enlighten the philosopher Noam Chomsky on the true nature of morality. Sam Harris enters the fray with all the enthusiasm of a Dr Seuss character, convinced that he will be able to demonstrate to Noam Chomsky the merits of green eggs and ham; or rather of the merits of his belief that even where America does wrong, that it has the moral high ground, because its intentions are good. And Sam Harris does admit that America is not only capable of doing wrong, but has in fact done so, as shown in this quote from his book, “The End of Faith,” which is part of the material he e-mailed. There is no doubt that the United States has much to atone for, both domestically and abroad. In this respect, we can more or less swallow Chomsky’s thesis whole. To produce this horrible confection at home, start with our genocidal treatment of the Native Americans, add a couple hundred years of slavery, along with our denial of entry to Jewish refugees fleeing the death camps of the Third Reich, stir in our collusion with a long list of modern despots and our subsequent disregard for their appalling human rights records, add our bombing of Cambodia and the Pentagon Papers to taste, and then top with our recent refusals to sign the Kyoto protocol for greenhouse emissions, to support any ban on land mines, and to submit ourselves to the rulings of the International Criminal Court. The result should smell of death, hypocrisy, and fresh brimstone. Despite all these acknowledgements of American wrong doing Harris believes that Chomsky is in error in comparing, what Harris considers the real good intentions behind apparent atrocities carried out by the American state, with the delusional beliefs of for instance Hitler and Japan in World War II, that the atrocities they committed were driven by good intentions. He sets out to demonstrate the genuine exceptionalism of America, by discussing the American bombing of the Al-Shifa Pharmaceutical plant in Sudan in August 1998, an act which may have resulted in the deaths of thousands of people, by cutting off their access to medication. He accepts that the death toll of this act was as Chomsky claimed comparable to that of the “horrendous crime” of 9-11. He understands Chomsky to be claiming that because the death rates are similar, the two acts are morally equivalent. He therefore decides to defend his thesis, of moral superiority by proving that the bombing of Al-Shifa was more moral than 9-11. In an attempt to achieve his aim he initiates the following protocol. Find a salient difference, between the apparently similar acts carried out by our side, and the other side. We know that our side are the good guys, and therefore this salient difference, whatever it is, will demonstrate to all right thinking people, the clear moral superiority of our side. Suggest/claim that anyone who doesn’t recognize the aforementioned salient difference as clear evidence of our moral superiority, is ethically unsound. This is the way of confirmation bias, and it is the technique that Sam Harris uses to no effect, on Noam Chomsky at any rate, in this e-mail exchange. He finds his salient difference, and argues that deliberately aiming to kill people is intrinsically more evil, than knowingly killing them as collateral damage. And if you didn’t know that you were going to kill them, because you didn’t even consider the possibility, before cutting off vast numbers of people from their only access to medication, that makes you less evil still. Noam Chomsky argues that this denigrates the value of African lives. It does more than that. It also denigrates the value of the lives lost in 9-11. The most important factor isn’t that thousands of people have had their lives stolen, but the goal of the perpetrators. Ethically speaking, intention is (nearly) the whole story. The difference between intending to harm someone and accidentally harming them is enormous—if for no other reason than that the presence of harmful intent tells us a lot about what a person or group is likely to do in the future. 1. al-Qaeda wanted and intended to kill thousands of innocent people—and did so. 2. Clinton (as you imagine him to be) did not want or intend to kill thousands of innocent people. He simply wanted to destroy a valuable pharmaceutical plant. But he knew that he would be killing thousands of people, and he simply didn’t care. 3. Clinton (as I imagine him to be) did not want or intend to kill anyone at all, necessarily. He simply wanted to destroy what he believed to be a chemical weapons factory. But he did wind up killing innocent people, and we don’t really know how he felt about it. Is it safe to assume that you view these three cases, as I do, as demonstrating descending degrees of evil? Being less evil than al-Qaeda is nothing to boast about, something that Harris seems cheerfully oblivious of. Something in fact that he is so unaware of that he regrets that Chomsky’s hostile attitude to him, means that he has been unable to explore with him the evidence that America is in fact morally superior to Nazi Germany and World War II, Japan. How should we doe for drink. He has rationalized the problem as one about intentions, one that has nothing to do with the horrific reality of thousands of human beings deprived of their lives. He doesn’t see himself as Chomsky does, as an apologist for mass homicide. I am also sorry that you evade the fact that your charge of “moral equivalence” was flatly false, as you know. Noam Chomsky seems to be of the opinion that having access to sufficient evidence, means that a normally intelligent person should be able to recognize the truth. He therefore judges Harris as being deliberately perverse. On the evidence of this e-mail, I would suggest that it is probable that Sam Harris doesn’t know that he is misrepresenting Chomsky, or that he has failed to provide an argument showing how the bombing of Al Shifa was an act of good intention. Arguing that America’s action is less evil, than the action of a terrorist group is not exactly high praise. Sam Harris’ moral compass reminds me less of a real compass and more of the one from Pirates of the Caribbean, pointing not to true north but rather to whatever his heart desires, in this case whatever conclusion paints him and the US as morally superior. P.Z. Myers noted in 2009 the operation of confirmation bias in the writings of the religious apologist Karen Armstrong. He finished an accurate take down of what Karen Armstrong said with the following intentionally funny quote. Bleh. What a mess of goo and vapor. I don’t doubt that Armstrong is an intelligent woman, but she’s giving us another reason why religion is bad for people and for nations: it turns good brains to mush. And that’s a condition that can only make toothless zombies happy. I think that the Sam Harris e-mail exchange with Noam Chomsky provides strong evidence that it is not just religious people that can have their brain turned to mush, by the operation of the noodly appendage. The inability to see the reality of your own side, compounded by the ability to see only evil in the other is an extremely dangerous instinct, in a world where weapons of mass destruction are extremely real. And where it is entirely possible that those in charge of those weapons, are operating instinctively under the control of the mythically inebriated Flying Spaghetti Monster. p.s. I discovered the zombies Karen Armstrong quote when following through allegations made by my fellow islander, Michael Nugent, in the post where Atheist Ireland publicly dissociated itself from the harmful and hateful rhetoric of P.Z. Myers. P.Z. Myers in his post “The Brine Shrimp Gambit,” does indeed claim to despise a lot of people, but it is their arguments, that he is targeting. I understand that it is very easy to become angry with people, when they appear to be justifying, the unjustifiable. So I empathize with both participants in this contretemps, but suspect that Michael Nugent is playing host to the Flying Spaghetti Monster. While P.Z. Myers is being driven by by his anger. This is his introduction to The Brine Shrimp Gambit. How adorable! A dodgy fellow has invented what he thinks is a new get-out-of-jail-free card, called the brine shrimp gambit. The brine shrimp gambit is a way of displacing the criticism to something other than its original target, so you can accuse your opponent of being unreasonable. He is quite right not to give the dodgy fellow the credit of being the first to invent it. It is used so ubiquitously, by the sophisticated and unsophisticated, that it is rational to treat it as product of a human instinct, that which I like to think of as the Pasta Fairy. There is no reason to think, that this was not a basic human instinct, even when the passage tombs of Ireland, which are older than the pyramids of Egypt were being built. There is however no reason to believe that the many noodly engravings found therein are a direct reference to it, or that the first people to settle in Ireland were in fact Ancient Noodlians. If you would resist the Pasta Fairy you must first recognize it. This entry was posted in innate deceiver, Jonathan Swift, Natural Selection and tagged Bobby Henderson, confirmation bias, Flying Spaghetti Monster, Noam Chomsky, P.Z. Myers, Sam Harris. Bookmark the permalink. You completely misunderstood Harris. When we look at the evidence of the Al-Shifa pharmaceutical factory, clearly Harris was wrong, Clinton Administration just bombed a site in retaliation. But Harris wanted to debate how ‘intent’ was a better measurement of the ethical nature of a violent act not ‘body count’. But Chomsky would not engage with this debate and instead lambasted him for his views on the Al-Shifa bombing, and his misunderstanding of Chomsky’s argument. Harris is idealistic but Chomsky made that exchange a debacle, not Harris. Hi Mikey Mike Mikey, thanks for the comment, but I am not in the business of blaming anyone. As I indicated I believe that Noam Chomsky was in error when he accused Sam Harris of knowingly misrepresenting him, and of being deliberately evasive. I found the e-mail exchange anything but a debacle. It provides a super example of a very dangerous form of confirmation bias, one that has a high potential for inducing violent conflict. This is an instinct that causes us to hold that the intentions of us and those like us must be good, and to invent justifications for those actions, and where we can’t to change the subject, or claim it as the exception that proves the rule . We don’t judge the other in the same way. It means that arguments about intentions have no validity. You appear to be in agreement with Noam Chomsky about Al-Shifa, look at the apparently evasive techniques that Sam Harris is using to avoid coming to a similar conclusion. Eh, in a world of guns, only the ones left are those who can pull the trigger rule. But still yes, I too believe Harris is misguided. But Chomsky lost a chance to change a mind with a sizeable audience. Oh Mikey Mikey, in a world of guns, Sam Harris is way more than misguided, he is completely away with the pasta fairy. Obliviously blind to any evidence that does not support his view that all the world is apple-pie, or rather that the American state is driven by altruism, trying to change his mind would have been pointless. He is in the same position as many religious believers, and as P.Z. Myers pointed out when brains are turned to mush, they are fit only to provide sustenance to zombies.